"Overdose" redirects here. For other uses, see Overdose (disambiguation). Activated carbon is a commonly used agent for decontamination of the gastrointestinal tract in overdoses. The term drug overdose (or simply overdose or OD) describes the ingestion or application of a drug or other substance in quantities greater than are recommended or generally practiced. An overdose may result in a toxic state or death. The word "overdose" implies that there is a common safe dosage and usage for the drug; therefore, the term is commonly only applied to drugs, not poisons, though even poisons are harmless at a low enough dosage. Drug overdoses are sometimes caused intentionally to commit suicide, parasuicide or as self-harm, but many drug overdoses are accidental, the result of intentional or unintentional misuse of medication. Intentional misuse leading to overdose can include using prescribed or unprescribed drugs in excessive quantities in an attempt to produce euphoria. Usage of illicit drugs of unexpected purity, in large quantities, or after a period of drug abstinence can also induce overdose. Cocaine users who inject intravenously can easily overdose accidentally, as the margin between a pleasurable drug sensation and an overdose is small. Unintentional misuse can include errors in dosage caused by failure to read or understand product labels. Accidental overdoses may also be the result of over-prescription, failure to recognize a drug's active ingredient, or unwitting ingestion by children. A common unintentional overdose in young children involves multi-vitamins containing iron. Iron is a component of the hemoglobin molecule in blood, used to transport oxygen to living cells. When taken in small amounts, iron allows the body to replenish hemoglobin, but in large amounts it causes severe pH imbalances in the body. If this overdose is not treated with chelation therapy, it can lead to death or permanent coma. The term 'overdose' is often misused as a descriptor for adverse drug reactions or negative drug interactions due to mixing multiple drugs simultaneously. Signs and symptoms of an overdose vary depending on the drug or toxin exposure. The symptoms can often be divided into differing toxidromes. This can help one determine what class of drug or toxin is causing the difficulties. Symptoms of opioid overdoses include slow breathing, heart rate and pulse. Opioid overdoses can also cause pinpoint pupils, and blue lips and nails due to low levels of oxygen in the blood. A person experiencing an opioid overdose might also have muscle spasms, seizures and decreased consciousness. A person experiencing an opiate overdose usually will not wake up even if their name is called or if they are shaken vigorously. 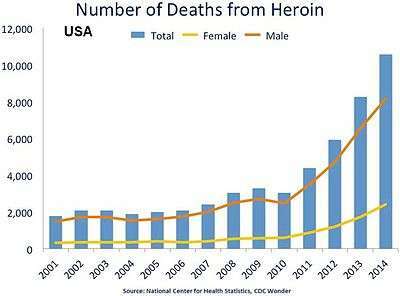 Timeline of number of yearly U.S. overdose deaths involving heroin. Timeline of number of yearly U.S. overdose deaths involving benzodiazepines. 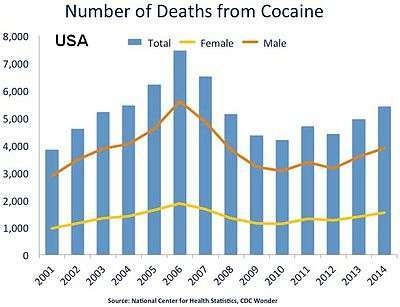 Timeline of number of yearly U.S. overdose deaths involving cocaine. The substance that has been taken may often be determined by asking the person. However, if they will not, or cannot, due to an altered level of consciousness, provide this information, a search of the home or questioning of friends and family may be helpful. Examination for toxidromes, drug testing, or laboratory test may be helpful. Other laboratory test such as glucose, urea and electrolytes, paracetamol levels and salicylate levels are typically done. Negative drug-drug interactions have sometimes been misdiagnosed as an acute drug overdose, occasionally leading to the assumption of suicide. The distribution of naloxone to injection drug users and other opioid drug users decreases the risk of death from overdose. The Centers for Disease Control and Prevention (CDC) estimates that U.S. programs for drug users and their caregivers prescribing take-home doses of naloxone and training on its utilization are estimated to have prevented 10,000 opioid overdose deaths. Healthcare institution-based naloxone prescription programs have also helped reduce rates of opioid overdose in the U.S. state of North Carolina, and have been replicated in the U.S. military. Nevertheless, scale-up of healthcare-based opioid overdose interventions is limited by providers' insufficient knowledge and negative attitudes towards prescribing take-home naloxone to prevent opioid overdose. Programs training police and fire personnel in opioid overdose response using naloxone have also shown promise in the US. Stabilization of the victim's airway, breathing, and circulation (ABCs) is the initial treatment of an overdose. Ventilation is considered when there is a low respiratory rate or when blood gases show the person to be hypoxic. Monitoring of the patient should continue before and throughout the treatment process, with particular attention to temperature, pulse, respiratory rate, blood pressure, urine output, electrocardiography (ECG) and O2 saturation. Poison control centers and medical toxicologists are available in many areas to provide guidance in overdoses to both physicians and the general public. Specific antidotes are available for certain overdoses. For example, Naloxone is the antidote for opiates such as heroin or morphine. Similarly, benzodiazepine overdoses may be effectively reversed with flumazenil. 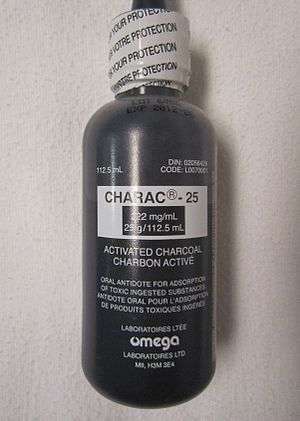 As a nonspecific antidote, activated charcoal is frequently recommended if available within one hour of the ingestion and the ingestion is significant. Gastric lavage, syrup of ipecac, and whole bowel irrigation are rarely used. Timeline of number of yearly U.S. overdose deaths involving prescription drugs. Timeline of number of yearly U.S. overdose deaths involving prescription opioid pain relievers. 47,055 drug overdose deaths occurred in the United States in 2014. Since 2000, the drug overdose death rate has gone from 6.2 per 100,000 persons in 2000 to 14.7 per 100,000 in 2014. The National Center for Health Statistics report that 19,250 people died of accidental poisoning in the U.S. in the year 2004 (8 deaths per 100,000 population). In 2008 testimony before a Senate subcommittee, Leonard J. Paulozzi, a medical epidemiologist at the Centers for Disease Control and Prevention stated that in 2005 more than 22,000 American lives were lost due to overdoses, and the number is growing rapidly. Paulozzi also testified that all available evidence suggests that unintentional overdose deaths are related to the increasing use of prescription drugs, especially opioid painkillers. However, the vast majority of overdoses are also attributable to alcohol. It is very rare for a victim of an overdose to have consumed just one drug. Most overdoses occur when drugs are ingested in combination with alcohol. According to the Centers for Disease Control and Prevention, every day in the U.S., 44 people die of drug overdoses. 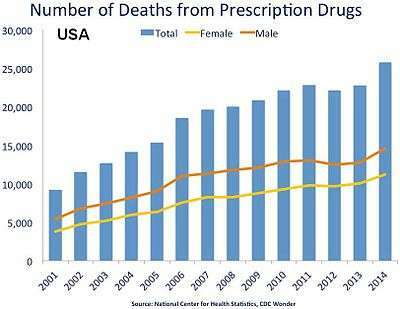 Drug overdose was the leading cause of injury death in 2013. Among people 25 to 64 years old, drug overdose caused more deaths than motor vehicle traffic crashes. There were 43,982 drug overdose deaths in the United States in 2013. Of these, 22,767 (51.8%) were related to prescription drugs. The 22,767 deaths relating to prescription drug overdose in 2013, 16,235 (71.3%) involved opioid painkillers, and 6,973 (30.6%) involved benzodiazepines. Drug misuse and abuse caused about 2.5 million emergency department (ED) visits in 2011. Of these, more than 1.4 million ED visits were related to prescription drugs. Among those ED visits, 501,207 visits were related to anti-anxiety and insomnia medications, and 420,040 visits were related to opioid analgesics. ↑ Definitions Retrieved on 20 September 2014. 1 2 "Stairway to Recovery: Glossary of Terms". ↑ Goldfrank, Lewis R. (1998). Goldfrank's toxicologic emergencies. Norwalk, CT: Appleton & Lange. ISBN 0-8385-3148-2. ↑ Chandler, Stephanie. "Symptoms of an opiate overdose". Live Strong. Retrieved 17 May 2012. 1 2 3 4 5 Overdose Death Rates. By National Institute on Drug Abuse (NIDA). ↑ "Column - Fatal Drug-Drug Interaction As a Differential Consideration in Apparent Suicides". ↑ Piper TM; Stancliff S; Rudenstine S; et al. (2008). "Evaluation of a naloxone distribution and administration program in New York City". Subst Use Misuse. 43 (7): 858–870. doi:10.1080/10826080701801261. PMID 18570021. ↑ "OD Prevention Program Locator.". Overdose Prevention Alliance. Retrieved 15 May 2012. ↑ "Community-Based Opioid Overdose Prevention Programs Providing Naloxone — United States, 2010". Centers for Disease Control and Prevention. December 2010. ↑ Beletsky L, Burris S, Kral AH (July 2009). "Closing Death's Door: Action Steps to Facilitate Emergency Opioid Drug Overdose Reversal in the United States". Center for Health Law, Policy and Practice, Temple University School of Law. doi:10.2139/ssrn.1437163. Retrieved 2012-05-12. ↑ Beletsky L, Ruthazer R, Macalino GE, Rich JD, Tan L, Burris S (January 2007). "Physicians' knowledge of and willingness to prescribe naloxone to reverse accidental opiate overdose: challenges and opportunities". Journal of Urban Health. 84 (1): 126–36. doi:10.1007/s11524-006-9120-z. PMC 2078257 . PMID 17146712. ↑ Beletsky L, Moroz E. "The Quincy Police Department: Pioneering Naloxone Among First Responders.". Overdose Prevention Alliance. Retrieved 15 May 2012. ↑ Lavoie D. (April 2012). "Naloxone: Drug-Overdose Antidote Is Put In Addicts' Hands". Huffington Post. ↑ Longmore, Murray; Ian Wilkinson; Tom Turmezei; Chee Kay Cheung (2007). Oxford Handbook of Clinical Medicine. United Kingdom: Oxford. ISBN 0-19-856837-1. 1 2 Vanden Hoek, TL; Morrison, LJ; Shuster, M; Donnino, M; Sinz, E; Lavonas, EJ; Jeejeebhoy, FM; Gabrielli, A (Nov 2, 2010). "Part 12: cardiac arrest in special situations: 2010 American Heart Association Guidelines for Cardiopulmonary Resuscitation and Emergency Cardiovascular Care". Circulation. 122 (18 Suppl 3): S829–61. doi:10.1161/CIRCULATIONAHA.110.971069. PMID 20956228. 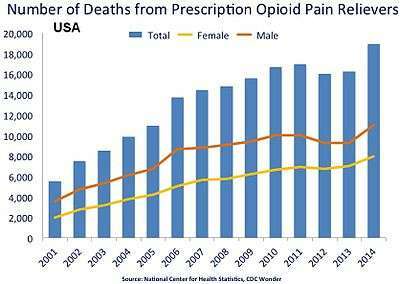 ↑ Increases in Drug and Opioid Overdose Deaths — United States, 2000–2014. Morbidity and Mortality Weekly Report from the Centers for Disease Control and Prevention (CDC). January 1, 2016 article. ↑ Referral Page - FASTSTATS - Accidents or Unintentional Injuries Retrieved on 20 September 2014. ↑ CDC Expert, Leonard J. Paulozzi, MD, MPH Retrieved on 20 September 2014. ↑ CDC Washington Testimony March 5, 2008 Retrieved on 20 September 2014. ↑ "The Persistent, Dangerous Myth of Heroin Overdose". ↑ Barnet, Shannon. "CDC: 2014's top 10 challenging public health threats". ↑ "Understanding the Epidemic | Drug Overdose | CDC Injury Center". ↑ "Prescription Opioid Overdose Data | Drug Overdose | CDC Injury Center". Nelson, Lewis H.; Flomenbaum, Neal; Goldfrank, Lewis R.; Hoffman, Robert Louis; Howland, Mary Deems; Neal A. Lewin (2015). Goldfrank's toxicologic emergencies. New York: McGraw-Hill, Medical Pub. Division. ISBN 0-07-143763-0. Olson, Kent C. (2004). Poisoning & drug overdose. New York: Lange Medical Mooks/McGraw-Hill. ISBN 0-8385-8172-2. Look up overdose in Wiktionary, the free dictionary.